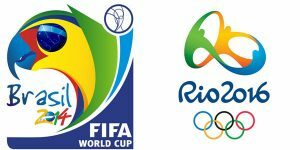 Two of the world’s premier events, the 2014 World Cup and the 2016 Summer Olympics, will be hosted in Brazil over the next three years. Spread over 12 Brazilian cities, roughly $50 billion US will be spent to build and improve stadiums, transport systems, telecommunication networks, water and waste systems, among many others in order to host these games. 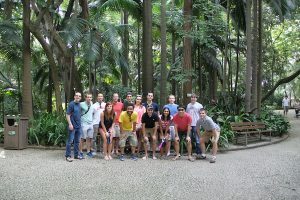 Thanks to the assistance of Campus Brasil’s Study Tours, The Global Leaders in Construction Management program will be touring projects in Sao Paulo and Rio de Janeiro, two of Brazil’s primary cities, as well as experiencing the culture of South America’s largest country. Our trip began by escaping from Chicago’s O’Hare Airport, which cancelled over 3,000 flights the same day due to one of America’s worst winter storms in decades. A foot of snow and high winds caused travel to be disrupted in a majority of the United States. Our plane was rerouted and changed several times during the day, but it was one of the few that was able to leave the bitter -50 degree wind chill and arrive in the 90-degree Sao Paulo summer. 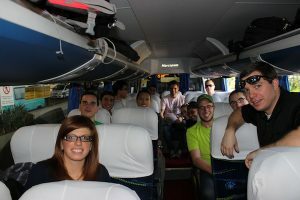 Our two trip coordinators Felipe Toledo and Leo Pastori met us in Sao Paulo International Airport with the charter bus that would take us to our hotel. After a quick safety orientation of Sao Paulo, we were lead on a walking tour of Paulista Avenue. This primary avenue is home to many large financial and cultural institutions, as well as many extensive shopping centers and cultural attractions. Notably, the Sao Paulo Museum of Art is famous for its brutalist structure and has been recognized as a modern architectural landmark. 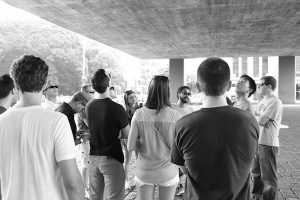 Felipe explained the buildings 1968 construction and history noting the gradual deflection of the main floor slab. Across the street from the Museum of Art, we walked through Parque Trianon. As one of the “lungs of Sao Paulo”, parks like this one are essential cleansing components of this city of nearly 12 million people. The lush tropical vegetation was once apart of the Atlantic Forest before the urbanization of Sao Paulo in the late 1800’s. 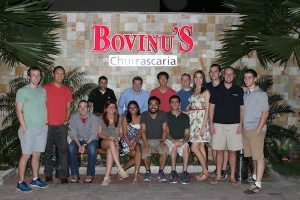 Bovinu’s is a traditional Brazilian Steakhouse restaurant and was a fantastic introduction to the cuisine of the Brazilian people. We were all able to dine on the endless buffet options and freshly cut meats that were served at our table.